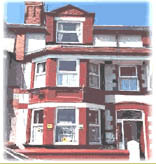 Pleasant Victorian bed breakfast hotel close to Anglesey's Old Harbour. Convenient for the ferry and rail terminal at Holyhead. If you need a room to kip down before tearing off on the ferry to Dublin then this is a fairly cheap option. The friendliness of the owner couldn't be faulted, keen as he was to help with travel plans and routes, and the breakfast was a worthy rather than lamentable add-on. What it lacks in fancy perks and luxuries it more than makes up for in cleanliness. It’s a basic proposition, certainly, but the majority of rooms have multi-channel TV including Sky Sports and en suite bathrooms private bathrooms for those that do not. Thick double-glazing keep the noise down to a minimum and the cool sea-draughts out. Private luxury bathroom in family room. Smart clean and spacious bedrooms with free wireless broadband and sports/kids channels. Excellent location by the Old Harbour, about 5-minutes from Holyhead Station.